Gridiron Games | The Next Generation of Football Pools - Play For Free! 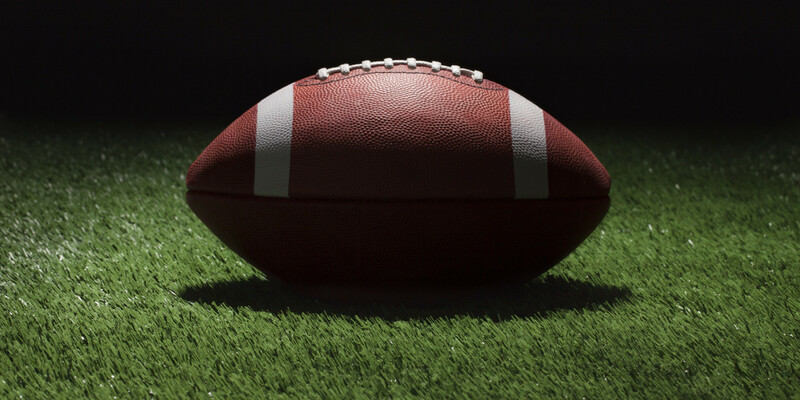 Fast, reliable, and optimized for the mobile world, Gridiron Games is the ultimate solution for managing your football pools online. Not only are we revolutionizing the way you play your favorite football pools today, we’re continually innovating to bring you brand new experiences you’ve never imagined before! Choose from a variety of games including our very own NFL Maxout or NFL Bingo and customize your pool to fit your exact needs. Arguably the most popular of all football pools, NFL Pick’em is extremely easy to learn how to play. Each week, players compete by selecting one team from each matchup that they believe will win. At the end of the week, the player with the most correct picks is crowned champion! 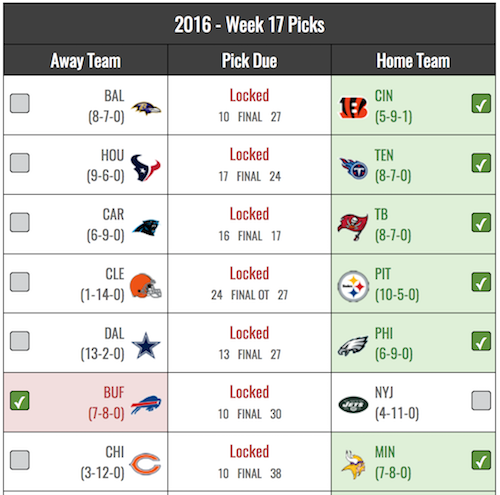 There are also a number of variations you can introduce into your pool to make NFL Pick’em more challenging and fun and we offer them all here on Gridiron Games. Also known as Eliminator, Knockout, or Suicide pools, NFL Survivor is the ultimate challenge of win or go home. Players compete by selecting one team each week that they believe will win, with the kicker being a team may only be selected once for the entire year. If a player’s team wins they advance to the next week, if they lose they’re out! Seems easy enough right? Think again. Even the most skilled of players can be eliminated early on. A Gridiron Games original, NFL Maxout is the addicting new football pool that combines elements of NFL Survivor with a unique scoring twist. Players compete by selecting one team each week that they believe will win, with the kicker being a team may only be selected once for the entire year. If a player’s team wins they receive the amount of points that team scored in the game. If their team loses, they receive 0 points for the week. Whichever player has the most points at the end of the year wins! Another Gridiron Games original, NFL Bingo is a thrilling combination of two classic games – NFL Pick’em and Bingo! 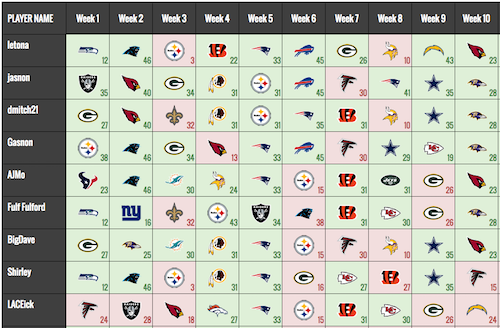 Players populate a 4 by 4 grid each week with teams they believe will win. 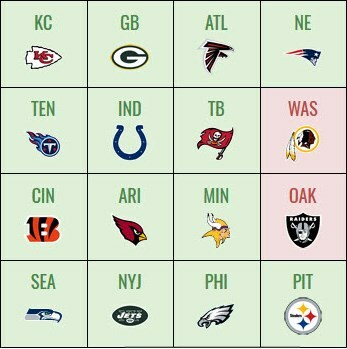 If the team wins, that square is marked as correct. The object of the game is to get the most bingos (4 correct squares in a row either vertically, horizontally, or diagonally). Sounds easy enough right? 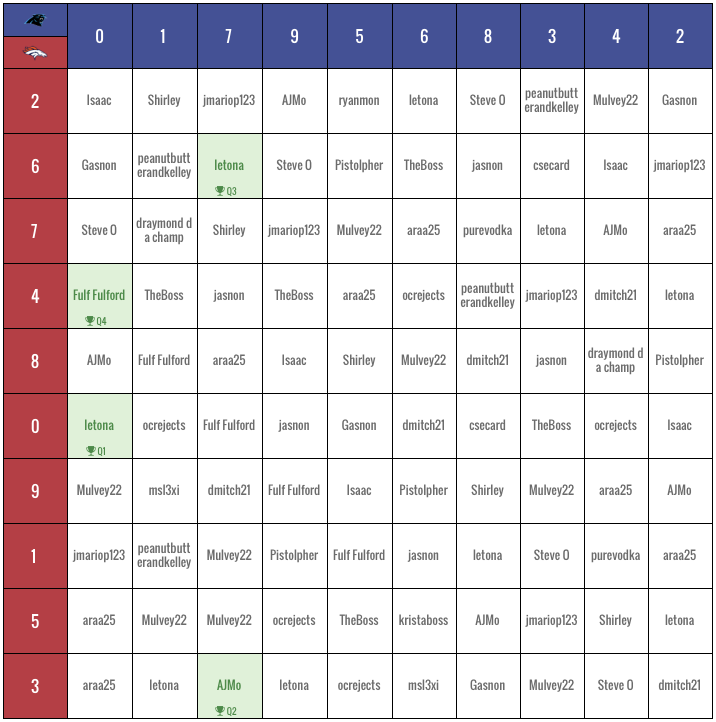 The difficulty (and fun) lies in the fact there are many different combinations of how you can arrange your teams within the grid, so even players with the same number of correct picks may not end up with the same amount of bingos! Super Bowl Squares is an exciting game that anyone can enjoy while watching the Super Bowl. Players compete by selecting squares on a 10 by 10 grid prior to kick-off of the game. 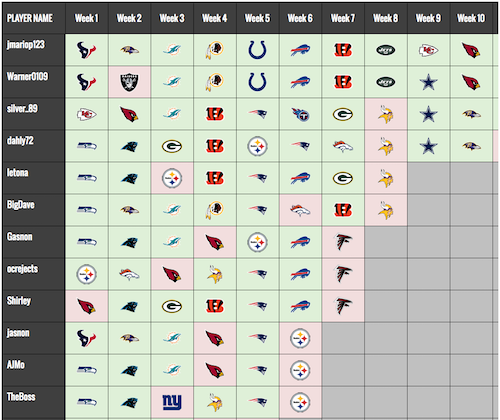 Once all squares have been filled out, numbers from 0-9 are randomly selected and assigned to the NFC/AFC colored boxes. At the end of each quarter, these numbers will correspond to the last digit of each team’s score, and if your square lies at the intersection of the numbers, you win that quarter! Super Bowl Bingo is a fun way to get everybody involved while watching the big game. 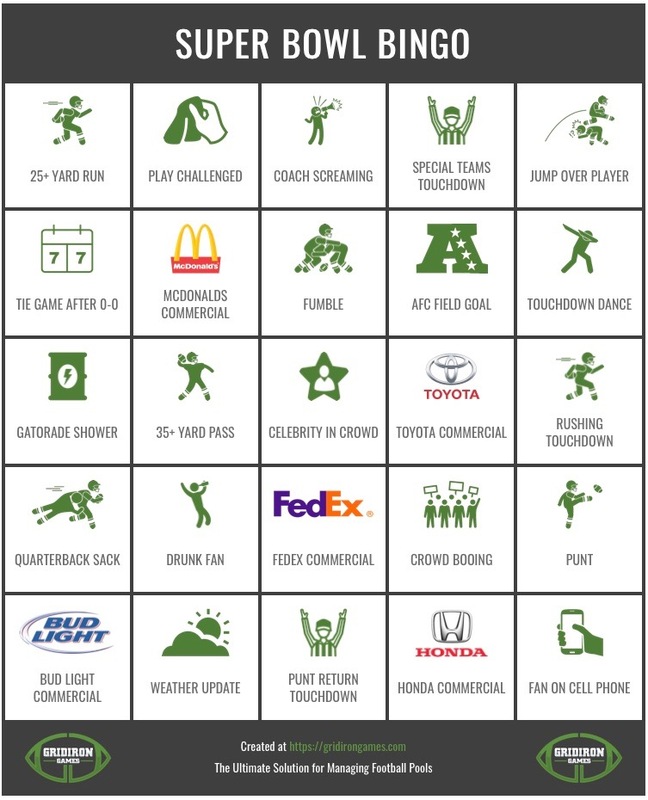 To play, simply print out our free Super Bowl Bingo cards and hand them out before the game. Once the game begins, pay attention to the events listed on your bingo card. After an event occurs you cross out that square, and if you’re the first to cross out all consecutive squares (either horizontally, vertically, or diagonally) you win! 2019 Gridiron Games, LLC - All Rights Reserved.